Fly on Mokulele to the enchanting island of Moloka‘i, pick up your rental car or take a shuttle to the Hotel Moloka’i, a genuine hideaway from all things mainstream. 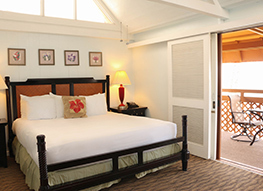 Located on the tropical beach of Kamiloloa and adjacent to Hawaii’s only barrier reef, you’ll find the Polynesian village of bungalows replete with kitchenettes and Wi-Fi. 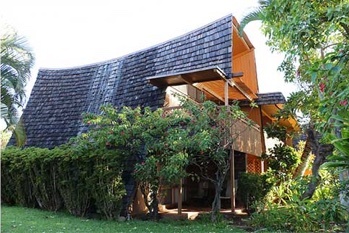 Known as the birthplace of Hula and deemed the “Friendly Isle,” Hotel Moloka’i is just five minutes from the island’s largest city, Kaunakakai. Furnished with 1 double or two single beds. Accommodates 1-2 people. 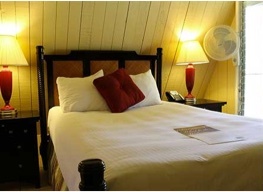 Furnished with 1 king bed and two twin beds. Accommodates 2-4 people. Furnished with 1 king bed. Package Options Price start at just $326! 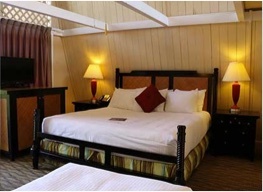 Additional Person Fee: Our Garden View Deluxe with Kitchenette Room can hold a maximum of 4 people. When booking, an additional fee of $25 plus taxes per additional person will be added to the total (maximum 4 people). If you wish to travel with additional people, please mention this during the booking process. Rates shown are subject to availability. Airfare includes all applicable air taxes and airport fees; hotel rates include specified room rate, Hawaii General Excise Tax, and Hawaii Transient Accommodations Tax (optional services such as but not limited to room service and room charges are not included and will be paid to the hotel direct). Car rental is based on an Economy Car and includes daily base rate only. All taxes, fees, and optional services are to be paid directly to rental car company. Shuttle Service rate is inclusive of all taxes and includes 1 bag per person. Rates are valid for bookings between 5/8/2017 – 5/31/2018. Cancellations must be made 7 days or more prior to scheduled departure date will incur a fee of $75 or a fee based on the number of days package is sold. No refunds will be given for cancellations made within 7 days prior to the scheduled departure date. Cancellations must be made by calling Mokulele Airlines Call center at 808.495.4188 or Hotel Molokai at 808.660.3408. No cancellations will be accepted by email or online. Any unused package component may not be exchanged, transferred, credited, refunded or have a cash value. Any changes made to the original dates for the reservation are subject to a change fee of $25 plus any difference in fare. Any changes extending the contracted agreements must be completed direct with Hotel Molokai, Alamo Rent-a-Car or Mokulele Airlines. All changes are based on availability, restrictions and limitations as provided by the individual vendor. No changes will be accepted by email or online. Changes must be made by calling Mokulele Airlines Call Center at 808.495.4188 or Hotel Molokai at 808.660.3408. Mokulele Airlines shall not be liable for damages for any delay or default in performing if such delay or default is caused by conditions beyond its control but not limited to, weather conditions, acts of God, force majeure, strikes, civil commotions, embargoes, and wars or other hostilities, whether actual, threatened or reported, and/or any other cause beyond the reasonable control of Mokulele Airlines, Hotel Molokai or Alamo Rent-a-Car. Mokulele Airlines shall not be responsible for reimbursement or claims of additional expenses incurred by customer as a result of a delay, diversion, or cancellation due to a Force Majeure Event. Mokulele Airlines shall not be held liable for any direct, indirect, special, or other consequential damages, whether stated in contract, tort, strict liability or otherwise, resulting from the acts or rendering of services in connection with this vacation package service.